Find My Workspace lists over 95% of the business centres market in Stanmore. Simply click Request Quote to check pricing for one office, or Add to Basket for multiple offices. 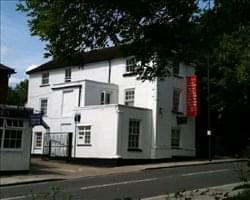 This locally listed three floor Georgian building is situated on the edge of the bustling Stanmore town centre but within the Stanmore Hill Conservation area. Whilst carefully retaining its individual quirkiness and many of its original features, the recent refurbishment has been carried out to a high technical standard. On site car parking is available to tenants and the space offers 24 hour access to the offices, a kitchen area and 24 hour security. To obtain information for your selected London Borough of Harrow Business Centres, please tick the "Add to basket" box for each office you prefer and complete the form below. We will then send a detailed report via email.